Maintaining proper humidity levels (air moisture) in your home is accomplished with a humidifier and is essential for human comfort as well as the protection of wood furniture and wood flooring. According to the Mayo Clinic, proper humidity levels ease skin problems and symptoms associated with breathing problems. They also note that humidifiers can make you sick if they are not properly maintained, or if your home’s humidity level is set too high. Use a humidifier but make sure it works correctly and is properly maintained. A central humidifier is a special piece of HVAC equipment fixed to the furnace that adds water vapor to the air discharged from your furnace. Humidifiers are used primarily in the winter heating season when humidity levels are low—dry winter air is what causes frequent static electricity discharge, dry skin, and nosebleeds. Newer tightly constructed homes have much less air infiltration than older homes. As a result, humidity levels are more easily maintained in these newer homes, reducing the need for a humidifier. Reservoir humidifiers use a rotating drum-styled foam pad or similar media that picks up water for evaporation from a float-controlled reservoir. These types are the most prone to mold problems, due to the reservoir that is constantly full of standing water. ​Flow-through drip-style humidifiers use a specially coated metal or plastic screen that has a small amount of water constantly dripping across it while the furnace is running. The water supply is flowing constantly with these, so there is a lower chance of mold problems. Steam humidifiers contain self-generating steam heaters and are the most expensive, lowest maintenance, and most efficient design. They are also the least prone to mold problems since there is no standing water supply—the steam is injected directly into the air flow. These humidifiers require that water has a certain range of hardness and quality. Some homes may require special filtration of the water in order to be suitable for a central steam humidifier. The drum style humidifier uses a float-controlled reservoir pan filled with water that saturates a rotating foam-covered evaporator drum pad. 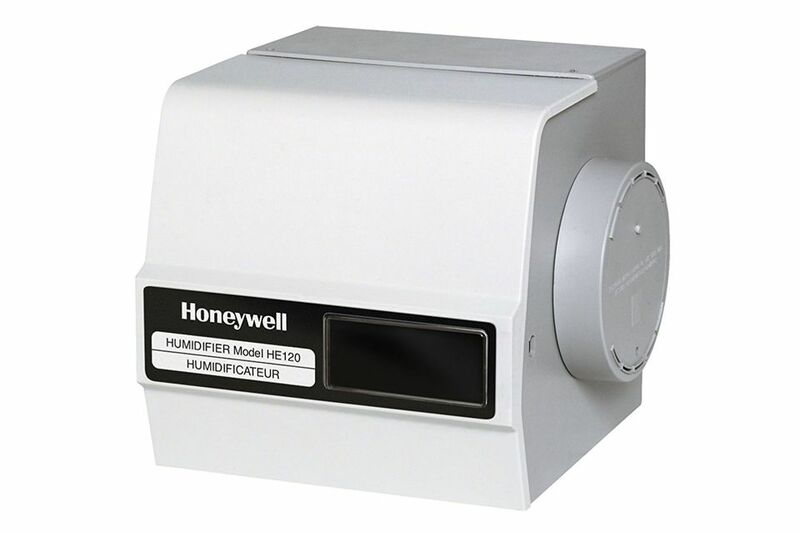 This style humidifier provides air flow through the rotating evaporator pad, which in turn adds humidity to the air. The unit may have humidity controlled with a humidistat. Turn off power to the furnace. Turn off the water supply tap valve to the humidifier. Depending on your humidifier’s design, loosen and remove the nuts, or remove the clips securing the humidifier cover. Remove the humidifier drum and check the pad. If it is hardened from mineral deposits, try to clean it using the approach described below. If that does not work, then the evaporator pad must be replaced. Remove the foam pad from the drum shaft by removing the clips or other fastening mechanisms on the center shaft and pulling the two drum shaft halves apart. Clean the foam pad by using a 1:3 solution of water to vinegar, or use a commercial calcium-removing fluid such as Lime Away®. Soak the foam pad until the deposits dissolve. Rinse the pad with clean water and repeat if necessary. If the pad is ripped or does not come fully clean, replace the foam pad. Replace the cleaned or new pad, and reinstall the drum to check for proper water level. Check owner’s manual for the proper depth if the unit does not have a marking in the reservoir showing the proper water level. Turn on the water supply to the humidifier. Allow the reservoir to fill until the water supply is turned off by the float assembly. If the drum rotates and dips into the water reservoir and is fully wetted, the water level is correct. To raise or lower the water level, adjust the float arm. There is usually an adjusting screw that attaches the float to the float lever arm. Loosen the screw and raise the float to raise the water level, or lower the float to reduce the water level. Turn the power back on to the furnace. Wait one hour to allow the humidifier to run, then check water level again and adjust as required. Check to make sure the water supply hose fitting is tight and does not leak; tighten with an adjustable open-end wrench if required. The flow-through drip-style humidifier uses water dripping onto a specially coated rectangular metal or plastic evaporator pad to add humidity to the air. These units control humidity with a humidistat. Pop open the clips that hold the inlet feed tube and distribution manifold in place at the top of the humidifier. The water inlet feed tube will now separate from the distribution manifold; then remove the manifold from the evaporative screen pad and the manifold housing. The water distribution manifold may be plastic or metal, depending on your style of the humidifier. If metal, you may have to clean mineral deposits away with a chisel or flat-blade screwdriver. Check the evaporator screen pad. If it has a scale, clean it using a 1:3 solution of water to vinegar, or use a commercial calcium-removing fluid such as Lime Away®. Soak the pad until the deposits dissolve. Rinse the pad with clean water and repeat if necessary. If the evaporative pad has not had monthly maintenance, it may have significant mineral deposits that flake off as the pad is bumped or twisted. If that is the case, then replace the evaporator pad with a new drip pad. Replace the evaporator pad annually. Check to make sure that the humidistat is calling for humidity when the furnace is running. Using the inlet fill tube located over the humidifier housing, open the water supply to the humidifier and turn the power on to the furnace. When the furnace begins running, the humidistat should call for humidity, the solenoid valve should open, and water should come out of the water inlet tube and drain into the humidifier drain. If it does not, check the humidistat with a multimeter or voltmeter checking for 24 volts across the fill valve/ solenoid terminals/ wires. If there is no voltage, the humidistat is bad. You can also do a “workaround” if you do not have a voltmeter. Turn the humidistat up to 80%. If the solenoid valve does not open and allows water to flow, turn the humidistat dial setting down to 20%, and then back up to 80%. You should hear a “click” sound coming from the solenoid valve. If you hear the clicking sound, the humidistat is working correctly. If the humidistat is working properly and there is no water flow from the solenoid valve, then the valve needs to be replaced. Once all components have been confirmed as working, reassemble the humidifier. A steam-style humidifier adds humidity to the air by heating water electrically until it boils to create humidity in the form of steam even if the furnace isn’t on. The steam is picked up by the system blower then pushed throughout the home vents. While annual maintenance tasks are similar for all brands of the humidifier, the exact maintenance routines vary from manufacturer to manufacturer. Turn down the humidistat to make sure the system does not enter a heat cycle while you are servicing it. Drain the system of water, following the instructions of your particular humidifier model. With some types, this involves shutting the power off then turning it back on while the humidistat is set to a low setting. Wait for the unit to cool fully, then remove the lid on the humidifier, following manufacturers directions. Remove the overflow pan from the unit, loosening the mounting screw if necessary. Remove the main drain tube and check to make sure that it is clean with no deposits clogging it. Remove the overflow tank (there may be a small amount of water in it) and clean any lime deposits you find, using a 1:3 solution of water to vinegar ora commercial calcium-removing fluid such as Lime Away®. Also, clean the scale from the metal water discharge and water supply tubes. Reassemble the tank, taking care to install any O-rings correctly. If the service interval calls for it, replace the water filter, as per manufacturers instructions. When finished, turn the power back on and reset the humidistat to the desired level.